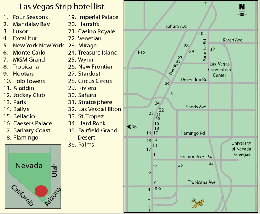 Las Vegas is known internationally as a shopping, entertainment, and gambling destination. Considering that Las Vegas was only officially considered a city in 1911, it has become the largest US city founded in the 20th century. Being the center of gambling in the world, Las Vegas is commonly known as The Entertainment Capital of the World or Sin City. The Strip is lined with massive and lavish fantasy-like casino resorts where availability of alcoholic beverages at any time is no trouble and entertainment of all kind can be found. But many more things can be found here such as museums, desert like, amusement parks, National Parks and Hoover Dam. Las Vegas can be just as much a family destination as well.